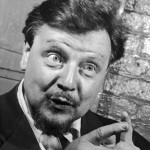 Austrian character actor Walter Slezak (b. Vienna, Austria, May 3, 1902; d. Flower Hill, NY, April 21, 1983), in his Hollywood years, for the most part portrayed heavies, villains, and suspicious foreigners like the German U-boat commander in Alfred Hitchcock’s Lifeboat (1944), but he had a knack for lighter roles as well (Born to Kill 1947, The Wonderful World of the Brothers Grimm 1962, Treasure Island 1972). He also had notable success on Broadway as a singing actor. Son of the world-famous Wagnerian tenor Leo Slezak (turned comic film actor later in life), Walter Slezak grew up intimately familiar with the musical theatre and film world of Vienna – his father was a permanent fixture at the State Opera. Nonetheless, he made an effort to avoid the professional stage as a medical student and as a bank clerk. Slim and willowy at twenty-one, he was persuaded by expatriate Hungarian film director Michael Curtiz (The Adventures of Robin Hood, Casablanca) to appear in the silent Biblical epic Sodom und Gomorrha (1922). Slezak rapidly became a popular romantic lead and made twenty-one silent films before a surprising stroke of luck caused him to leave Vienna in 1929. Even while making films, Slezak was carrying on a vigorous career on the operetta stage as well. One night a representative of Broadway producer Lee Shubert appeared at his dressing room and engaged him to appear in New York in the musical Meet My Sister (1930). It was a mistake: Shubert had intended to engage a different singer, whom he had heard in the operetta some days before. Slezak was just substituting that evening, and neither he nor the representative was aware of the confusion. Nevertheless, Slezak was a hit and spent the next dozen years on Broadway in musicals and comedies (Music in the Air 1932, May Wine 1935, I Married an Angel 1938, even a musical version of The Trojan Women 1941). He knew, however, that efforts to keep his youthful figure were bootless (though he would never grow quite as corpulent as his father) and decided to switch to comic and character roles. He was offered his first American film role in Once Upon a Honeymoon (1942), as the Nazi husband of Ginger Rogers and rival of Cary Grant. He would make a total of forty-four feature films before retiring, including Sinbad the Sailor (1947), People Will Talk (1951), Emil and the Detectives (1964), Dr. Coppelius (1966), and The Juggler of Notre Dame (1970). As skillful at comedy (Bedtime for Bonzo 1951, Call Me Madam 1953) as he was at villainy (Lifeboat, Cornered 1945), Slezak was sometimes given the opportunity to combine the two (The Princess and the Pirate 1944, The Inspector General 1949, Abbott and Costello in the Foreign Legion 1950). Slezak returned to Broadway now and then in the 1950s (My Three Angels 1953, The Gazebo 1958), most outstandingly in Fanny (1954) with Florence Henderson and Ezio Pinza. For his portrayal of Panisse the sailmaker he won the 1955 Tony Award® for Best Actor in a Musical. At age eighty, afflicted with arthritis and other ailments, Walter Slezak took his own life with a gunshot to his head in his own back yard. He is buried with his parents at the Egern Friedhof in Munich, Germany.